Part of the DNA structure of an extinct elephant has been worked out by scientists. Using a fossilised tooth, from a Mastodon which died in North America 130,000 years ago a team from the Institute of Evolutionary Anthropology in Germany have mapped the mitochondria DNA of the animal hoping that this will provide an insight into the ancestry of modern elephants. Teeth are made of enamel and are the hardest part of the body. The DNA within the tooth structure is protected from decay and damage as the rest of animal deteriorates. However, finding such well preserved genetic material in a fossil this old is extremely rare. Mastodons are cousins of the more famous Mammoths and are generally associated with North America. The genetic material recovered from this tooth, when compared to preserved Mammoth DNA and the DNA of modern elephants will help biologists to build up a more accurate elephant family tree. This research confirms work done in the 1990’s that showed that mammoths were more closely related to Asian elephants than to African elephants. The close relationship between Asian elephants and mammoths has been known for some time and scientists have speculated whether they could resurrect the Mammoth by fusing recovered Mammoth DNA with an egg cell from an Indian elephant that has been stripped of its own genetic material. There is still a lot of interest in the evolution of the elephants. There two species alive today (African and Indian, the Forest Elephant of Africa is a sub-species of the African elephant), are believed to be the last representatives of a group of hoofed mammals called Proboscideans. The earliest fossil elephant material consists of some teeth fragments (see teeth are good at being preserved); recovered from Palaeocene sediments from Morocco. These remains are believed to be about 60 million years old and the animal has been named Phosphatherium. It lived in the dense forests that covered much of the world at the time and was no more than 60 cms high at the shoulder. From these small beginnings the elephant group evolved and spread across most of the Northern Hemisphere. There were many species of elephants around at the time that modern humans began to spread from their African homelands. Early man revered the elephants, many cave paintings indicate that they were important animals, certainly many species were hunted. Some scientists speculate that this hunting led to the extinction of many elephant species such as the Mammoths, but the demise of these magnificent creatures may have been done to a number of factors. Climate change, plus the introduction of domesticated dogs and the diseases they brought with them may also have contributed to their demise. Mammoths and their like remain very popular with children. Everything Dinosaur surveys regularly show Mammoths in the top ten of most popular prehistoric animals. 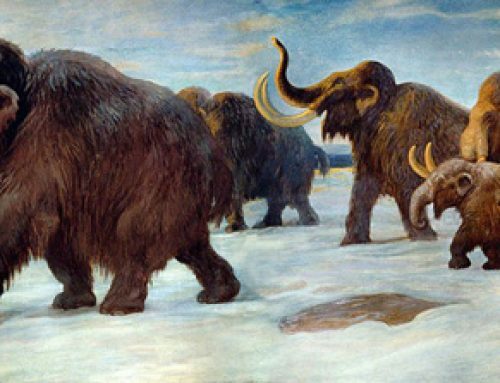 Mammoths and their Ice Age contemporaries such as the Woolly Rhino remain a source of fascination.